Russ Berrie Tumbleweed Bunny is a Large Retired and Rare plush rabbit. 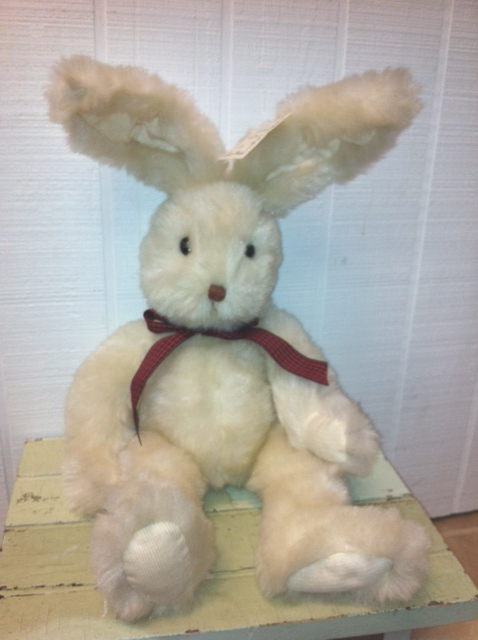 This bunny is a beautiful cream color and is wearing a raspberry red and black checked ribbon around his neck. I would estimate it to be at least 10 years old or older. It comes from my Retail Store stock. Russ Berrie Tumbleweed Bunny is a non-jointed floppy style bunny. His fur is very soft. The feet pads and inside of the ears are inset with an ivory colored corduroy fabric. His ears are bendable. This bunny is retired and rare.